Jaffa is one very special puppy that got trapped in a folding chair and no one knew who caused the accident. 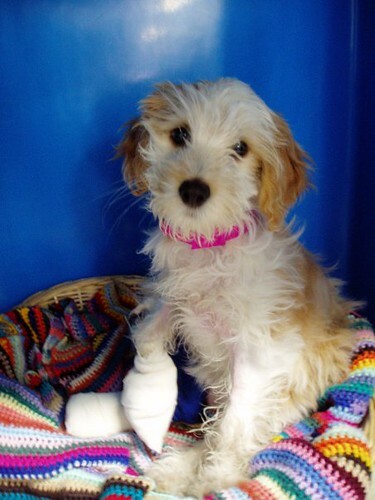 She lost a few of her toes on her front legs & fractured her back leg in the process. She was stabilised and then surgery had to be performed to tidy up the damage on her front leg and surgically repair her fractured back leg. Ten minutes after we put her under anaesthetic, her heart stopped. She had to get intracardiac adrenaline and we managed to resuscitate her. We had to press on and complete her surgery. During her recovery, we were prepared for her heart to stop again. We often manage to revive patients when their heart have stopped but it is rare that they survive long term. 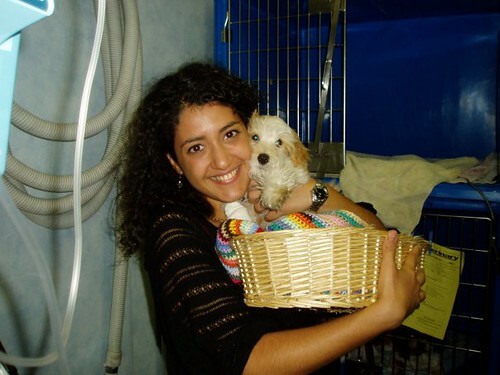 This is the second puppy that I have witnessed surviving after cardiac arrest. I think pupps are so full of life and fight hard to survive and conquer everything! A true miracle! ‘Yeah thats my jaffa she is still going strong and when she wants cuddles or attention she lifts her front paw as if 2 say its sore but she has no problem digging holes with it. I never got 2 say thank u 2 u and tony 4 everything u guys did 4 her she truely is a amazing dog and so loyal 2 me and my family. I will try and show u a pic of how shw is now. Thank u rayya’. That sure made my night :-). So glad to hear Jaffa recovered so nicely and you were able to help her. Way to go with resuscitation – The will of animals to survive never ceases to amaze me. Sounds as if Jaffa has a loving home with owners that care very much. Pats on the back for everyone. Thanks heaps for the pats on the back. Jaffa was a big winner and you are exactly right in mentioning that it was due to a combined effort owners & vet team together! How nice for Jaffa’s owner to contact you through FB to let you know how she is doing after she returned home following her surgery; you must have been thrilled! She is a cute pup! O my – what a sweet puppy. So glad she’s alright. That is so awesome that you could help her! Thanks for sharing.